A Short History of Subbuteo. Player Types - A very quick guide to heavyweights, lightweights, zombies and the rest. The Team Colours Project (Ongoing illustrated team lists). 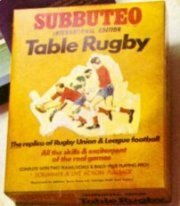 Subbuteo Assns intro; The ETSA in the 1970s; The FISA and FISTF - A three page history of Subbuteo playing (mainly) in the UK. This history is based on old catalogues and is really a history of Subbuteo Sports Games Ltd, and the standard items available to "bedroom floor" players like myself. There is an interesting alternative history covering Subbuteo tournaments, and the serious competitive side of the game at a site called Subbuteo Table Soccer page. This shows the game's development in terms of its expert players and the adjustments made to figures to improve control. It also looks at the various table football associations, the association's split with Subbuteo Sports Games Ltd, and the united federation of the 1990s. This is a fascinating read, and a bit of an eye opener. I guess a full history of Subbuteo needs to cover this, but I'm avoiding it for the time being - it's a long way from my experiences, and strong feelings on these issues still seem to exist. Subbuteo was launched in March 1947. It was invented, manufactured and solely distributed by Peter A Adolph from his base in Langton Green, Tunbridge Wells, Kent. The first sets were sold by mail order, and also at events such as the 1947 "Schoolboys Own Exhibition". The first sets were very basic, but that isn't too surprising considering the effect the war had on raw materials, and the initial small scale production. The set was called the assembly outfit, and came in a small red cardboard box - about the size of an early 1970s team box - with a brown label on the lid explaining the contents. Inside were two cardboard team sheets with printed players waiting to be cut out, 20 small plastic bases for the outfield players, and two rectangular brown bases for the goalkeepers with metal rods for control. The goal frames were assembled from metal wire (the crossbars were a separate piece), and the goal was finished with a card net - brown on the inside, green with printed black net on the outside. You were also given a piece of chalk, and paperwork including rules, accessory order form, feedback request etc. There was no pitch with the early sets. The piece of chalk was provided so that you could mark out the pitch on an old army blanket. After the war every home had one of these blankets, and it kept the set small and cheap to produce. The original set had bases made from buttons obtained from Woolworths (with a "pendulum" washer added for weight). Peter Adolph wanted to call the game "The Hobby", but the trade mark office decided (quite rightly) that this was too generic. Being an avid ornithologist, Adolph instead used the Latin name of an English bird of prey called the hobby (Falco Subbuteo). This is why the results can be confusing if you search the internet for "Subbuteo". The bird's head became a Subbuteo crest in the 1970s. More research is needed, but it is usually suggested that Peter Adolph got the idea for Subbuteo from a similar tabletop football game called Newfooty, which had been made since the 1920s and 1930s. The two games certainly look alike - Newfooty has card players in small bases, and a goalkeeper on a wire rod. However, Newfooty bases were originally made of lead, and it was Mr. Adolph's registered design plastic bases, and their relationship to the player figure set into them, that revolutionized table football. The card figure wasn't just there to represent a footballer. He was a crucial part of a beautifully weighted, self-balancing playing piece. When Peter Adolph talked about players "carrying the ball at their feet" he's not joking. They could swerve, and spin, and do a pretty mean chip shot. If like me, you owned a 1970s OO scale set, and wondered how on earth you were supposed to do some of those moves in the spin leaflet - go try them with a flat player. Control was fantastic, and Peter Adolph had a winner on his hands. As an interesting aside to this story, I've been told that a friend of Peter Adolph's named Ernie Sharp helped with the initial work on the game. Mr. Adolph actually offered to go into partnership with Mr. Sharp, but his friend decided the game would never catch on, and declined. There were no hard feelings though, as Mr. Sharp's grandson had a house full of Subbuteo as a child (thanks Simon for the info!). A final note about the 1940s sets. The instructions gave the shooting area as a semi circle. "Start the semi circle 9ins from the centre spot, with the ends meeting the touchline 15ins from the half way line... tie a length of string around the chalk in order to draw in compass style....". This sounds a bit of a pain frankly, and Peter Adolph was already switching to an easier method by 1949. On the spin leaflet of that year, there was no shooting line at all, and players could shoot if the ball was closer to the goal than to the halfway line, as long as the player was in the opposition's half. The first change to be made was the introduction of press-out card teams. The trouble with cut out players was simply that it was difficult to follow the outline of the player with a pair of scissors without bending the player, especially the thin area at the ankles. This bend would be bad enough in an outfield player, but it was fatal to a goalkeeper - the heavy ball would just push him over. This could sometimes be rectified by use of a matchstick glued to his back. However, the press out figures solved this problem, and were also made of a stronger thicker card. The only downside was the thick black border around each player, which sometimes intruded onto the figure and looked unattractive. The press-out teams were closely followed by another improvement, a flat celluloid plastic figure, who was advertised as early as the 1949-50 catalogue. The blurb for this figure stated that he was "scientifically designed to be 100% self balancing, and almost unbreakable". I'm not sure about the 100% claim (this isn't a Weeble), and they do suffer from lost heads and broken ankles, but it was a big improvement on the card figures in both areas. This came at a price though. A single packet of eleven celluloid figures (set O), cost twice as much as the set of two card team sheets (Set G). For this reason, the two versions ran side-by-side throughout their existence. Set Q - The clip on metal goal holding device. Set R - A material for treating goals "so the ball stays in the net even after the hardest shot"
Set T - Flags with metal bases that went under the pitch, with the flag pole pushed through. along with advances like the baize pitch, and the assembled deluxe goals. However, I said at the start of this chapter that it was Mr Adolph's vision for his game that impressed me. Hidden away in the sets of the time is another small document entitled "It's more than a game, it's an organisation". This goes on to say "you are now an owner-player, so please take advantage of all the facilities". In this document Adolph encouraged buyers to write to him with their views of the game (prizes available), and he stated that if they have any queries, or didn't understand anything, they should not hesitate to ask him. But the key facility seemed to be the "Table Soccer Players Association". The importance Peter Adolph placed on his Association can be guessed at by referring back to the 1949-50 accessory list. The Assembly Edition was Set A, but Set B was the subscription to the Players Assn, and Set C the Advanced Table Soccer booklet, which explained how to set up your own leagues and affiliate them to the Assn. This appeared in the accessory list before any sets of spare players, balls or anything of that nature. By 1953 there were three editions of the game designed for different budgets. The basic assembly version was renamed the Popular Assembly Outfit and cost 10s 1d. The mid range set was called the Combination Edition, and featured celluloid players and deluxe assembled goals. It cost almost double the price of the smaller set at 20s 1d. Top of the range was the Super Assembled Set, which had a pitch, in addition to already assembled players and goals attractively displayed within a large box. This set would set you back 46s 8d. Set W - Automatic bell ringing time keeper "scientifically correct to the second" - Wow. This was actually just a kitchen timer. Set Y - A surround apparatus. Which was just a piece of twine supported by metal clips at a height which stops the ball rolling off the table. Set Z - a card score recorder. It is important to point out that these items were of a simple practical nature, designed to assist in the playing of the game itself, rather than having any connection to real football. This gave 1950s Subbuteo an abstract feel, more akin to table tennis I suppose. It wasn't really a toy at this stage. It was a tactical tabletop sport. The early range of accessories is now described in The A-Z range. The early box sets can be seen on the first page of the box sets. As early as 1953 there was a "companion games" catalogue showing a big range of other games, which really highlights Peter Adolph's imagination. For such a short period of time, this is an amazing creative burst. Soccer Market - a football card game. The first companion game, released in 1948. Cricket - This arrived in January 1949, and featured figures based on the football ones, but used in a new and novel way. The bowler and bat were both shaped like a flat footballer, but with appropriate pictures on them. The bowler had a metal ball holder on the back of the figure, and when his head was tapped, this dispatched the ball over his head towards the wicket. The bat figure had a handle out from the base, and is held upside down. You then played the ball with the card/celluloid bat. The game play was so successful, that it transferred to the OO scale version in the late 1960s. Rugby, featured player discs that resemble small draughts, although they were rolled along on edge in play. The penalty kicker used the same technique as the cricket bowler. Not invented by Peter Adolph. The final Peter Adolph Subbuteo games of the 1950s cashed in on the space race. Journey into Space and By Spacecraft to the Moon. The first of these was played using a model of Saturn made of a plastic ring and a balloon, which you fitted to the picture rail. You then launched your bladed flying saucers at Saturn by propelling them along twisted wire 'launchers' with a length of plastic tubing - with the aim of landing them on Saturn's rings. By Spacecraft to the Moon used the same saucers, but simply used the box as the moon's surface. Soccer Market is shown under Card Games. Fivesides is on the Five-a-side editions page. Rugby is (naturally enough) featured on the rugby page. Speedway is part of the Racing Games range. The space games are on the Miscellaneous page. The Arrival of 'OO' Scale Dimensional Figures and the Continental Editions. In the early 1960's, Subbuteo started to produce the now legendary three dimensional OO scale figures, which are the form Subbuteo is still produced in today. The new editions and accessories were given the grand title "Continental Type" and were given a new reference system, starting with C100 for a complete team, and rising, by the 1980's, to C206. Why Continental? Well, this was the period where English football started to wake up to the flair and skill of continental teams like Real Madrid, and Benfica. and so Peter Adolph chose "Continental" to add some of this sophistication and glamour to the new range, as well as taking the game to a new level. The first OO scale teams were little different from the later ones. The bases were newly designed, and bigger than the base on the flat players. They also came in two parts, an outer and an inner, which could be different colours. Inside the bases were hollow, with a washer glued in to provide weight. The early player figure himself was a rather primitive affair. He had a v-necked, short sleeved shirt, and had almost a 2D feel to him. The shirt design matches those worn in cup finals in the late 1950s, and as worn by the Busby Babes. The player fitted into the top of the base using a thin bar, pretty much in the same way the flats did. However, these teams inevitably played differently to the flat figures. They showed reasonable balance and spin, but were nowhere near as good as the older figure. The base was only slightly higher, but this made chipping more difficult too. Where the new figures had the edge was in straight flicks, especially over distance, where the extra width of base added stability and the figure was less likely to tip onto its curved edge. In addition, a bigger surface area of base hit the ball, and with the extra weight of the figure, shots could be pretty devastating. This first figure is known as the early, or short-sleeved heavyweight and was produced until 1967, during which time the team number list reached 52, with an additional non-numbered range of international teams produced for the 1966 World Cup. This competition came at a good time for Subbuteo Sports Games, who were just raising their profile. The figure then changed to what is probably the most famous design of Subbuteo footballer, known to all and sundry these days as the heavyweight. This figure had a long sleeved, round necked shirt and some fine detail work. The patternmaker for the figure was Charles Stadden. He was a military modeller, who also designed the drivers in 1970s Scalectrix, and also worked for Triang, Corgi and Meccano. 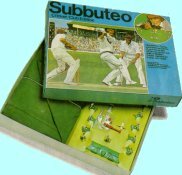 For Subbuteo, Mr. Stadden not only did the pattern for the heavyweight, but he also did cricketers, spectators, Targetman, the first three cups (Jules Rimet, European Championship, and FA Cup) and more besides. His patterns were made in pewter. The teams themselves were all hand-painted and assembled. This was done in a cottage industry using the housewives of Tunbridge Wells, and it was this system that creates the team variations that we all know and love. For instance, the two colour bases were usually matched to the team colours. This meant, for instance, a blue and white striped team could be on blue outers and white inners, or visa versa. But the teams had to be assembled using whatever base colours they had available, so this same team might appear with say, light blue inners, or something even more inappropriate. Occasionally, a base colour change even occurred within a single team. In addition, sock colours don't seem set in stone in the 1960s (after all, the flats just have black printed socks). There are tales of Subbuteo workers mixing up their own paints when they ran out of a colour, and of them painting "special" teams not in the catalogues for their own kids. This is partly what gives early Subbuteo its wonderful feel. You never know what is out there waiting to be discovered. Obviously the new "realistic" OO scale figures were much more attractive to the school boys of the time, and this was the period where Subbuteo really started to take off. The other key thing was that the teams were now sold complete in an attractive team box. This allowed them to be easily sold in toy and sports shops around the country. Although the two figures mentioned above (with bar fittings) were the ones seen in the C100 team boxes of the day, they were not the complete picture when it comes to figure types from this era. In the new box sets (Display, Club, Floodlighting, and later International) the figures are of different designs, with their feet moulded into the inner base. I don't know whether these players were experimental, or whether they were cheaper to produce. Obviously, they were quicker to assemble, and they didn't paint the boots, so perhaps they were used to speed up production of the box sets. You can visit my Player Types page to look at the different versions of these figures. The Continental accessory range started with a bang, as along with the teams came a big new product - floodlights. These, and the other early accessories in the range - the photographers, the TV Tower, the red fence with its advertising boards - changed the emphasis of the game. Now it had more appeal to fans of other scale models of the time as the sets resembled model railway accessories or Airfix figures. It became much more what we would regard as a modern toy. If you were being negative, you could say that the change is summed up by C103 - the tracksuited team. This was an attractive set, but you could not possibly use them in play - "scientifically designed to be 0% self balancing" would have summed them up. They were just a toy... but I don't see it that way. Trackside models on a Hornby railway are not essential to running your rolling stock around, but they add depth to the enjoyment. The same is true of Subbuteo classics like the TV Tower, or the brown scoreboard with its little lights, and Daily Express advert. And even with their adverts and real-life football simulation, both the scoreboard and the red fence were more practical than the sets they replaced. The new range of accessories wasn't all OO scale stadium equipment. There was also the delight of the Subbuteo tie (C115). See the 1960s continental accessories on the C100-C120 page. See the early OO scale range of figures on the old heavyweights page. A return to other Sports - OO Scale Rugby and Cricket, plus other oddities. With the success of the OO scale footballers, it was obvious that the rugby and cricket games would have to be redesigned to match them if they were to continue. Cricket was launched around 1966, and rugby by 1969. These two sports then continued to be produced until the mid 1980's. Both proved more difficult to capture in miniature play, although they do have their own charms. Cricket was the first arrival, and the better game. It was based on the 1950s version using the same flat bowler as that set, and the same batting technique, only with a stronger plastic bat. The fielders were now on catching bases, and it was really satisfying to place a couple of slips, and then take a catch. The game also successfully retained its Subbuteo flavour because of the accessories (such as the rectangular pitch) and the scale used. This is regarded by many as the most fun and entertaining game Subbuteo ever produced. The small cricket accessory range was also delightful, with a nice blue scoreboard, sight screens, and a spectator set including one asleep in his deckchair. Ahh... The joys of cricket. The rugby set was less successful. It was completely redesigned from the 1950s version, and now looked and played more like football. However, flicking an odd shaped ball to indicate that the player was carrying it, proved difficult, and the scrum device also required a leap of imagination. The conversion kickers, (like the later football corner kickers) were definitely the most entertaining part. The original sets were sold with a new chunky look player, with dips in the base to hold the ball during lineouts, but later sets just used ordinary heavyweight footballers. The game itself was a bit of a struggle to be honest. It was very difficult to run with the ball, and the game usually ended up with lots of short tactical flicks in the middle of the field. Luckily, the game and the teams looked fabulous, and again it had a few nice accessories. The team range started with 25 sides, and expanded to reach 37 in 1978. There were other shorter lived spin offs including, in the mid 1970s, Snooker Express, which also covered pool and was played by flicking a player at the balls like in Subbuteo (which seems a bit pointless), and Targetman a game "for the younger soccer enthusiast". Both had a big pitch with a rebound wall (like the five-a-side Football Express). In Targetman, the players were larger, and the right leg of each was on a metal spring-like clip which you pulled back and let go to strike the ball. I'm informed that the ball could be struck viciously, or delicately chipped depending on how hard you pulled the leg back, and how close you positioned the player to the ball. It reminds me of Super Striker a late 1970's football game from Palitoy which recently made a comeback. 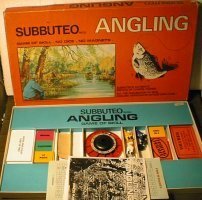 A completely different kettle of fish (very sorry) was Subbuteo Angling. This was sold in 1970-73, and was really just a board game. You moved around the board collecting tackle, bait etc. until you had everything you needed to fish. Then, once you landed on a place to fish (a lake or river etc.) you stated what you were fishing for, and if you caught anything a "ready reckoner" would give you the weight. Obviously, the biggest weight of fish won. The key component of this was a strange "UFO shaped" object that a ball bearing (or dried pea) was dropped into, which took the place of dice. While the other sports in the range just ticked along, the 1970s was the era when Subbuteo table football really did go continental if not global. The decade started with "The First International Table Soccer Tournament" on August 22-23rd 1970 at the Savoy Hotel in London. At stake was the John Waddington World Cup Trophy. Thirteen countries with organised Subbuteo Assns took part - Belgium, Eire, England, Gibraltar, Holland, Israel, Malta, Northern Ireland, Scotland, Switzerland, USA, Wales and West Germany. This event proved Subbuteo could mirror real football, as none of the British sides made the semi-finals, and the winners were West Germany. The next Subbuteo World Cup was the famous Munich World Series of 1974. This competition was immortalised by the huge Munich box set, and by the Subbuteo World Cup song (C136). At least England did better in this competition, reaching the final before losing to Holland. The best place to chart the spread of Subbuteo across Europe is probably the team list. In 1971-72, this list has reached 81, and only featured a few of the top International sides. These were teams that English players might want, like AC Milan, Barcelona or River Plate. However, by 1973-74 the chart had reached 165, and had groups of teams from Holland, Italy, Switzerland, South Africa, Austria, West Germany, and France. In 1978, the chart took another giant leap to 322 teams, and sides from Scandinavia, Portugal, North America, Argentina, and Greece were added. The accessory range continued to expand and improve. A major part of Subbuteo's familiar look started here. The goalkeeper rods change to green plastic around 1969-70; the fence changed to the famous green one "new for July 1970". The floodlights became the white scaffold version in 1971. Add to this the introduction of the medium sized, harlequin balls (1969), the big orange corner flags, the World Cup goals (1972), plus the corner kickers and throw-in figures (1972-73) and you have the Subbuteo everyone remembers. The 1970s also saw the top-of-the-range box sets getting bigger, with the World Cup 1970 Edition trumped by the Munich World Series Edition which featured just about the whole accessory range. This in turn was replaced by the Stadium Edition, a huge set with a grandstand as the centre piece. This was also the time of the Daily Express five-a-side tournaments on Wednesday night's Sportsnight. Subbuteo did their own version of the game called Football Express, and this was played on a half-sized pitch built into the bottom of the box, with a rebound wall and lock-in goals. Ten popular teams from the standard Subbuteo range were available in a special five-a-side format. However, the biggest change of the 1970s came out of the rapid expansion here and abroad. This was a change in player production technique, and with it a new figure (or two). 1977-80 The Arrival (and departure) of the Zombie. The zombie first appeared circa 1976, simply because Subbuteo Sports Games Ltd needed a football figure that could be painted and assembled by machine. They were expanding their markets abroad, the game was more popular than ever in the UK, and they were struggling to hand paint enough teams. I'm guessing their UK wage bill was also spiralling worryingly along with the inflation rate of the time. There was no way to paint/assemble a heavyweight by machine, so Subbuteo designed and released a new simpler figure, now cruelly tagged the zombie because of his lifeless look. You can see how machine assembly was achieved if you take one apart. The weight was no longer glued in, as there was a connection inside the base onto which the washer was placed. The top of the base, and pegged figure then fitted together on top, with the base inner helping to secure the weight into place. The earliest zombies have plain base tops, i.e. without the word "Subbuteo" around the edge, and I wouldn't be surprised if they were rushed into production. Although the figure was designed for machine printing, it is also found hand painted. Often the same teams can be found in both versions. Other teams had the basic colours added by machine, but the trim added by hand. When the 1981 catalogue talks about the new production methods of the lightweight, it mentions "two painting machines and two assembly machines", and the old painters obviously carried on alongside the new machines. On the downside, nobody seems to like these figures at all. From the heavyweight player the look is definitely a step backwards. They are ugly and unloved. The Italians disliked them so much that their factory took to making their own heavyweight figure on a peg. Or you can choose another destination from those listed below.